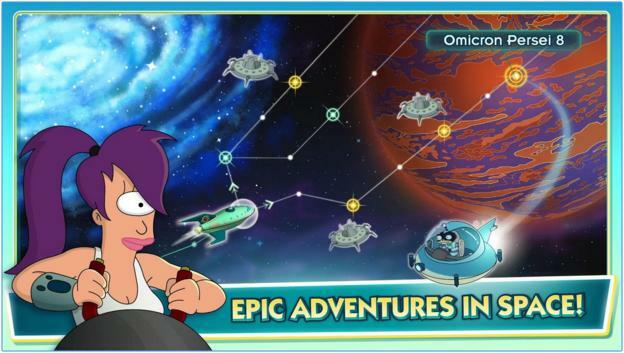 Futurama: Worlds of Tomorrow, from Jam City’s TinyCo and FoxNext Games, is a fun game app that brings together several game genres, all wrapped in the cool, quirkiness of the Futurama cartoon world. This game is equal parts city building, choose-your-own-adventure story, arcade style combat, and space exploration. 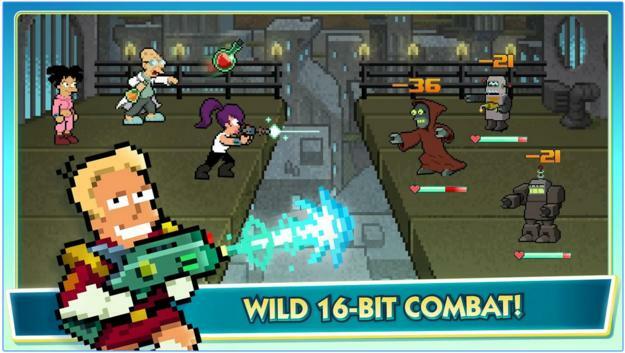 As you play, all your favorite characters from the television series will join in on the fun, pushing you through a story that has been crafted by Matt Groening and David X. Cohen, the writers for the original series. The mysterious villain, Hypnotoad, has damaged the fabric of space-time, ripping holes in reality and sucking your friends into unknown peril. You must search across the galaxy to find several alien artifacts that will help you mend these holes and save the universe. This tale puts you in contact with some very funny characters, like Amy’s eccentric parents, and some crazy amphibian cronies of Hypnotoad, all of whom will keep you coming back again and again, to see what hijinks will happen next. As I said, there are many elements to this game, meshing together several game genres. As the story progresses, you’ll seamlessly transition between these elements for an experience that is always changing and never dull. 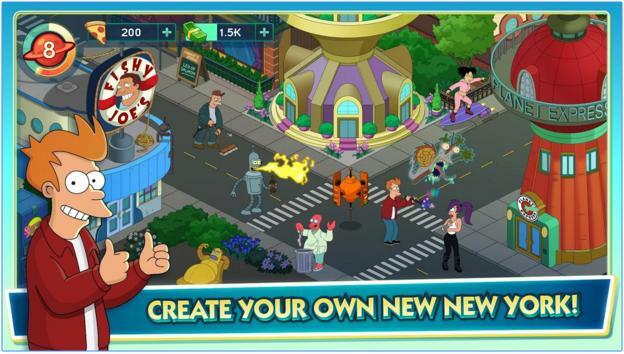 Fry, Amy, Bender, and The Professor will each give you quests to complete and bring special skills to the table, useful during combat as well as the choose-your-own-adventure sections. You’ll start off unlocking areas of your city, and constructing items for the characters to interact with. Some of these will be buildings that you can collect in-game currency from, and others will drop quest items if you send a character to perform an action at them. As you unlock and build more stuff, the characters’ quests will send you out into space, to search for those alien artifacts. You’ll navigate your space ship across galaxy maps, stopping at various planets to have an adventure. Sometimes, this will entail attacking some space toads in a fabulous, 16-bit, arcade style battle, and other times it will include a lot of conversation with other characters. 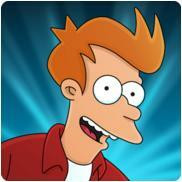 You’ll need to choose one of your own characters to talk to them, like Fry or Amy. Your choice may give you a conversational advantage, so pick wisely. Then, you’ll get to choose your responses to everything the other characters say during the exchange, from a list of options. Your success during these missions will be determined by your choices, so pay attention and be polite…or not, as the case may be. You can level up your characters as you progress, to give them advantages in both battle and communication skills, and as the characters level up, you’ll unlock more quests and activity options. There is so much to do in this game! 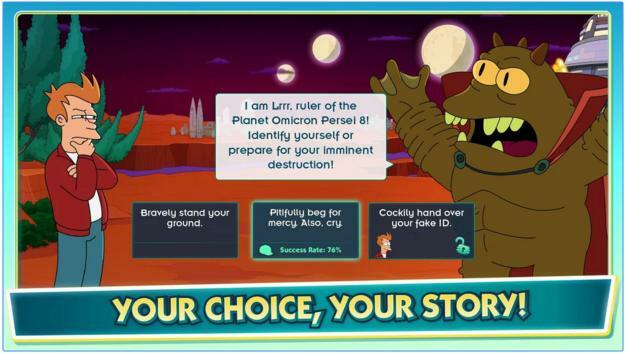 Futurama: Worlds of Tomorrow will provide you with hours of hilarious dialog and humorous story situations. With so many different game modes, you’ll never get bored of exploring space with the weird and wonderful cast of characters. For long time fans of the show, you’ll get a kick out of being part of the beloved world of Futurama, and participating in an original story from the creators of the series. Even if you’ve never seen an episode of the show, the story and dialog are sure to draw you in and engage you in the game play. I encourage you to download a copy for yourself, for free, from Google Play or the Apple App Store.